This past Sunday, Roger Federer won the 2015 Brisbane International, defeating Milos Raonic in three sets. The win was more than a title. It marked the Swiss maestro’s 1000th career win on the ATP World Tour. 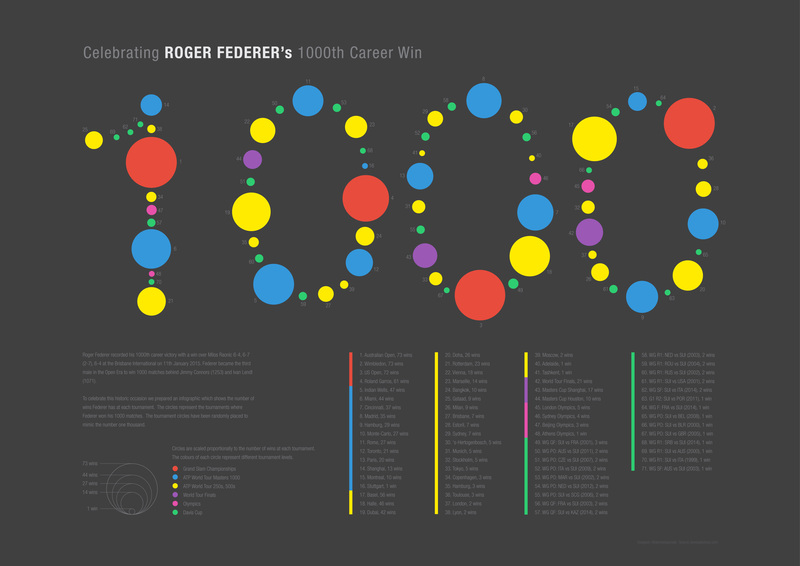 Geospatial Designer Damien Saunder (@damiensaunder) created an infographic celebrating the thousand wins of the 33-year-old Swiss, showing a distribution of his wins at each tournament. Federer joins Jimmy Connors (1253) and Ivan Lendl (1071) as the only three players to eclipse 1000 career wins. Watch full coverage of the 2015 Australian Open on FedFanTV. Download the official mobile apps for iPhone, iPad, and Android.